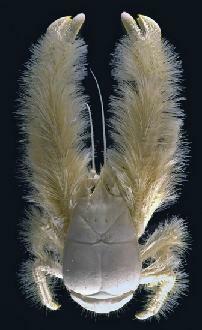 Kiwa hirsuta, the famous "hairy lobster." This website was created as an assignment for the Organismal Biology class, an incredibly challenging one-semester survey of plant and animal biology taught at the University of Wisconsin—La Crosse by Drs. Tom Volk and Greg Sandland. Dr. Volk is a world-renowned mycologist who has maintained the famous fungus website at TomVolkFungi.net since 1994. Dr. Sandland is a parasitologist and winner of the 2007 Ashton Cuckler New Investigator Award. The assignment was to pick a single species related in some way to one of the winter holidays (Christmas, Chanukah, New Years, or Kwanzaa) and create a web page devoted to it. Because I am enamored of things new, I decided to profile a novel species. I stumbled across an article describing the discovery of a new species, Kiwa hirsuta, one of whose common names is "hairy lobster." Since lobster has remained a popular item of holiday fare for centuries (though ironically, the "hairy lobster" is probably inedible), I decided this species was a perfect fit for my project. Click image to view handbook online. To say this undertaking has been demanding would be an understatement. With the exception of the page template, I wrote the HTML almost entirely by hand, which probably took much longer than designing in the university-issue WYSIWYG website editor might have, but at least afforded me the opportunity to write code as simply and elegantly as possible and thereby to format the pages exactly as I wanted them. Compounding the problem was the fact that because K. hirsuta is still so new, very little rigorous literature exists on it. 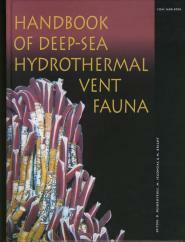 To my knowledge, only three scientific journal articles specifically mention the species (one of which was written before the species was officially described), and the 544-page Handbook of Deep-Sea Hydrothermal Vent Fauna (2nd edition), which dedicates a mere two pages to the species, is owned by only 45 libraries worldwide!